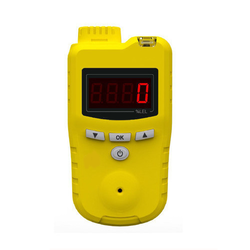 Our range of products include lpg gas detector, gas detector, hydrogen gas detector, infrared hydrocarbon gas detector, portable gas detector and toxic gas monitors. Owing to the trust of clients, located worldwide, we have become the leading manufacturer and supplier of LPG Gas Detector. This should be placed 15-25cm above the floor, the offered leak detector is checked in terms of quality so as to deliver a defect free range. This leak detector is designed with sophisticated technology keeping in mind the diverse needs of the customers. 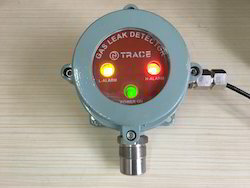 We provide this leak detector to our customers on various specifications. 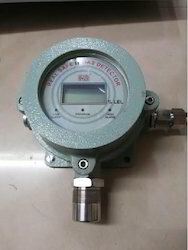 We are one of the manufacturer and supplier of Gas Detector. Our offered products are highly demanded in market due to their long life and super quality. Offered system is exclusively designed and manufactured using the best quality components and modern technology. Furthermore, to ensure that we are offering a quality-approved range. When designing a battery room, ventilation requirements need to be taken into consideration. Lead acid motive power batteries give off hydrogen gas and other fumes when recharging and for a period after the charge is complete. Hydrogen Gas Monitoring in the % LEL range and proper ventilation in the battery charging area is extremely important. A hydrogen-in-air mixture of 4% Vol H2 (100 % LEL H2) or greater substantially increases the risk of an explosion. The concentration of hydrogen should be kept below % LEL range to provide a safety factor. Hydrogen gas is color less and odourless. It is also lighter than air and will disperse to the top of a building. As a noteworthy entity of this domain, we present patrons with the premium quality of Infrared Hydrocarbon Gas Detector. 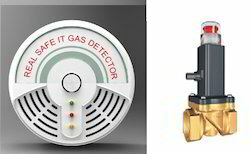 Designed by using latest technology, the gas detector is used for detecting different flammable hydrocarbon gases such as methane, Ethane and Propane. Owing to its standard sensor technology and automated operations, the infrared hydrocarbon gas detector is highly demanded. We have been in the field of manufacturing and supplying Portable Portable Gas Detector that is used for effective detection of gas leakage in various places. This is manufactured using high grade components and the cutting-edge technology under the supervision of trained professionals. 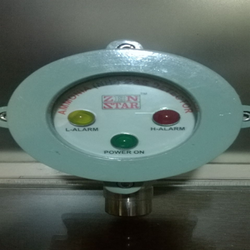 Our offered detector is tested on various parameters by our quality controllers. Besides, clients can avail this detector from us at the most reasonable rates. Auto-Zero: With Sample Gas As Pure Nitrogen. Auto-Span: With Sample Gas As Fresh Air. Alarm: Adjustable Low And High Alarm. The gas detector in intended to be used in an ambience where there is possibility of presence of Hydrocarbon gases. 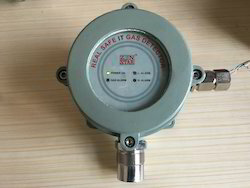 The detector must be explosion proof for continuous monitoring of combustible gases and vapor in the ambient air. The transmitter must be reliable and designed for harsh environment. Principle: Infra red Sensor with double compensated beam i.e. two beams one acting as reference beam and another as active signal beam for unrivalled signal stability and no interference from environmental influence. Non imaging optics, compensation for temperature & ageing. Measuring Gases: Flammable gases and vapors. (N.G, LPG & Condensate). The central controller. HART digital signal: Present. Alkanes or saturated hydrocarbons such as methane,ethane, propane, butane, pentane, hexane, and heptane, etc. Cycloalkanes such as cyclopropane, cyclohexane, methyl cyclohexane. Alkenes or unsaturated hydrocarbons such as ethylene,propylene, butene, pentene, hexene, octene, etc. Acetylene has absorption at 3.1 microns which is not detectable. Cycloalkenes such as cyclohexene and pinene. Aromatics such as benzene, toluene, and xylene. Alcohols such as methanol, ethanol, propanol, and allyl alcohol. Amines such as dimethyl amine, trimethyl amine,butanamine, cyclopropanamine, and pyridines. Ethers such as dimethyl ether, ethyl ether, n-propyl ether, methylvinyl ether, vinyl ether, ethylene oxide,tetrahydrofuran, furan, and 1,4-dioxane. Ketones such as acetone, methyl ethyl ketone,pentanone, methyl isobutyl ketone and heptanone. Aldehydes that have a central wavelength mostly at the 3.55 micron region and generally have a weak detection signal at 3.4 microns.Carbon dioxide at 4.3 microns and carbon monoxide at 4.6 microns have very little interference by other gases. 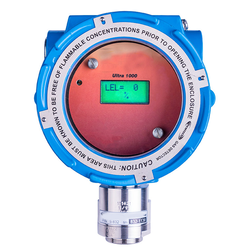 Real Safe IT Field proven gas Transmitter continuously monitors for dangerous concentrations of gases. The Gas sensor give Relay output with % of LEL LCD Display Gas Sensor can interface directly with any receiving instrument starting from indicators, controllers to large control system. The standard system consist of a compact electronic module housed in weatherproof & explosion Proof enclosure with an application specific sensor. This state of art transmitter is carefully designed with and manufactured with industrial grade components for reliability accuracy and long life. Gas Sensor enclosure is suitable for the CCOE ( PESO ), CMRI, IP65 certified. Real Safe IT Field proven gas Transmitter continuously monitors for dangerous concentrations of gases. The Gas sensor give Relay output with LED Indication Gas Sensor can interface directly with any receiving instrument starting from indicators, controllers to large control system. The standard system consist of a compact electronic module housed in weatherproof & explosion Proof enclosure with an application specific sensor. This state of art transmitter is carefully designed with and manufactured with industrial grade components for reliability accuracy and long life. Gas Sensor enclosure is suitable for the IP65 certified. Ammonia is a widely used chemical that can be found in a variety of common industrial environments. It is a colorless gas with a pungent suffocating odor. Ammonia is characterized as a flammable although it is very difficult to ignite. When exposed to heat, an ammonia solution will decompose to form ammonia gas and oxides of nitrogen, (NOx). Ammonia is an irritant and will become extremely irritating as concentrations increase. -2m horizontally within the range of possible gas leakage. very difficult to ignite. When exposed to heat, an ammonia solution will decompose to form ammonia gas and oxides of nitrogen, (NOx). Ammonia is an irritant and will become extremely irritating as concentrations increase. Concentration of Ammonia Effects 0-25 Minor irritation of the eye and respiratory tract. 50-100 Swelling of the eyelids, conjunctivitis,vomiting,irritation of the throat. 100-500 Concentrations are dangerously high, Death can result, prolonged exposure.